Printed pieces can be expensive. Direct mail can be REALLY expensive. And if all of it ends up in the trash, you’ve basically flushed money down the toilet. Today we’re going to share a few marketing mailer tips… Specifically how you can keep them out of the trash can (at least temporarily). 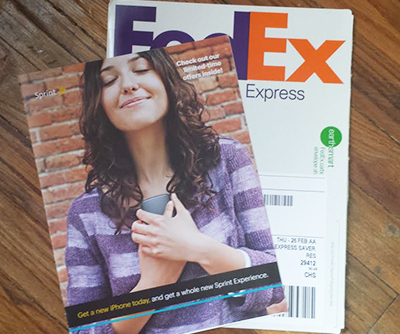 Sprint paid to FedEx a personalized letter and flyer about the new iphone. So why is this significant? Well we opened it for one. Had this been an over-sized postcard, it would have ended up in the trash without a second glance. When it comes to mailers, an envelope can work to your advantage. * You may not be able to FedEx every marketing piece, but simply thinking outside of the business envelope can help to get you noticed. Invitation sized envelopes work well, and if you have the time to hand address it, I can pretty much promise you that it will get opened. Soooooooooooo I have one more funny Sprint story before I sign off… My husband and I are longtime Sprint customers, and last December we received (what appeared to be) a hand addressed Christmas card from Sprint’s CEO. Of course it wasn’t actually hand addressed (under close scrutiny you could tell that it was a cleverly designed font), but I determined that only after opening it. My husband and I thought it was so funny, that we actually displayed Sprint’s Christmas card with the others that we received from friends and family. A marketing piece hung in our house for about a month, and was the subject of several passing conversations. Kudos to Sprint on the creativity! Ready to put some creative thinking to work for your small business? Email Kendall@rootedid.com to schedule a complimentary call. *Direct mail (postcards) can be an extremely effective marketing tool. Cost, message and target audience should be considered when deciding between direct mailer or targeted mailings. Our office is comprised of Panthers, Falcons and Saints fans, but it’s time to face the music. The NFC South just didn’t produce any Super Bowl contenders this year. What gets the most attention (shares and media mentions) after the game is over? How do big brands encourage engagement and content sharing? How do they use hashtags? As far as I’m concerned, there is one thing that is better than the game and ads combined… THE FOOD. The following are a few of our favorites. Feel free to share yours in the comments section below! Directions: Visit DamnDelicious.net for the full recipe. Jennifer prefers college ball, but she roots for the Falcons on Sundays. Directions: Soften a block of cream cheese over low heat. When softened, add both cans of corn(drained). Continue stirring over low heat. Add 1/2 jar or so of chopped jalapenos (drained). Add more or less jalapenos based on how much heat you can take. Continue stirring, then transfer to a small casserole dish. Serve with Tostitos Scoops. It's sure to be a big hit, and you can throw it together in less than 10 minutes! Kaelyn is a Georgia native and Falcons fan. Wonder how her Panther loving boyfriend feels about that? Directions: Visit ShockinglyDelicious.com for the full recipe. Cheers to learning lots and eating tons!